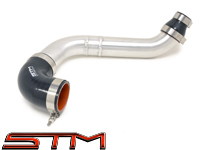 STM is pleased to announce the addition of the Evo 4/5/6 to our catalog! We are currently working on adding and updating all the compatible OEM and aftermarket parts for the Evolution IV-V-VI models. In the meantime, feel free to give us a call for parts and check back often as we release the new STM Evo 4/5/6 USA-made parts line-up! 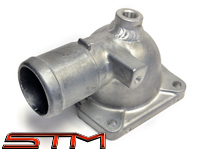 The STM Power Steering Reservoir is a direct replacement for the factory Evo 4/5/6 unit. Features a lightweight, aluminum construction, handmade in-house at STM with your choice of finish option. 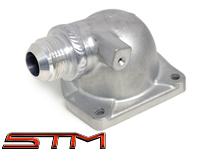 The STM Coolant Overflow Reservoir is a direct replacement for the factory, plastic Evo 4/5/6 tank. Features a lightweight, aluminum construction, handmade in-house at STM with your choice of finish. 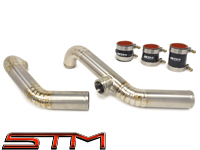 The STM Evo 4/5/6 Intercooler is made in-house from a 800 HP-rated 3.5" Garrett core with tig-welded, aluminum end tanks, bead-rolled 2.5" pipe outlets and pressure tested to 50 psi. 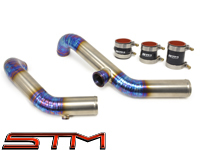 Features pie-cut, tig welded 2.5" titanium tubing for strength and durability, then burned a beautiful blue/purple/gold hue for the show-winning presentation. Available with either a stock or TiAL flange and the option for an AIT bung. Features pie-cut, tig welded 2.5" titanium tubing for strength, durability and general awesomeness. 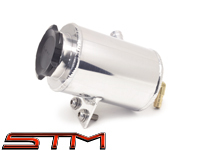 Available with either a stock or TiAL flange and the option for an AIT bung. Includes 6 stainless T-Bolt clamps and 3 high-quality black, silicone couplers. Features smooth, mandrel bent, lightweight 2.5" aluminum piping with bead-rolled ends with your choice of blow off valve flange and the option for an AIT bung. Includes 6 stainless T-Bolt clamps and 3 high-quality black, silicone couplers. 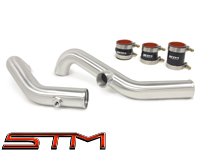 Made from lightweight, tig welded, 2.5" aluminum piping and designed to fit specifically with the STM Evo 4/5/6 FMIC and the factory turbo or stock frame, bolt-on turbos. 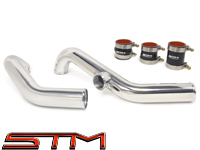 Includes high quality STM silicone couplers and stainless T-Clamps and is available with your choice of finish. 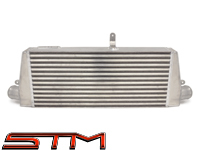 Allows you to not only shed the weight of the giantic, factory brick battery, but this modification clears the path for new upper intercooler pipes. This kit is available with a brushed aluminum finish or the flashy, mirror polish and includes all necessary hardware for a simple, bolt-in install, no drilling necessary. 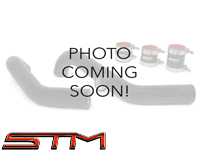 The STM Small Radiator Kit is designed for those looking to lose excess weight for drag racing, or for those running the forward-facing style turbo kits. 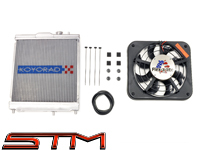 Includes a STM custom-modified Koyo radiator, Shrouded Fan, fan mounting kit and all necessary mounting hardware. 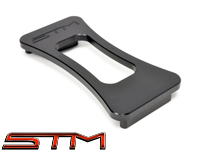 After months of testing and running multiple passes deep into the 9's at over 160 MPH with full weight street cars we are pleased to announce the release of the STM Evo Race Block! Track & dyno tested to 10,000 RPM and 1000+ HP and available with the options to be O-ringed and/or concrete filled. 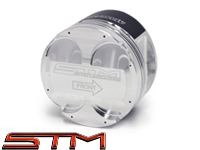 The STM-Spec Manley Custom 11.5:1 Pistons for 2.0L 4G63 are now available! These are the same gas ported pistons we have been testing in our STM Race Engines and easily trapping 165+ MPH in the 1/4! The STM-Spec Pistons are only available in 85.5mm bore and come with coated skirts, rings and wrist pins. STM Cam Position Sensor Housing Covers are an easy, bolt-on piece to clean up your engine bay - Because every detail counts! The Evo 4/5/6 valve cover only uses the exhaust side cover. 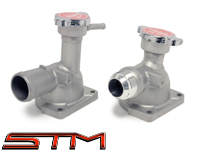 STM Custom Water Necks feature a welded spout for the radiator cap and are designed for race applications where the radiator may be relocated or modified. The STM Water Necks are offered with or without the welded -12AN bung. 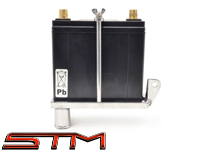 The raised design brings the cap above the cylinder head to easily bleed out air in the system. Easily run -AN fittings from your water neck to radiator! Also available with a convenient 1/8" NPT bung welded right on top for a clean install with your water temperature sensor & gauge. The STM Evo 6 Factory Water Neck with NPT Bung starts with an OEM Mitsubishi piece, modified to accommodate a 1/8" NPT bung for a clean install with your water temperature sensor & gauge. 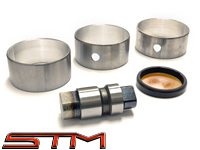 The STM Balance Shaft Removal Kit includes Clevite block off bearings, a genuine OEM Mitsubishi stubby shaft, and an OEM Mitsubishi block off plate for your front cover. Works with any 4G63, Evolution 1-9 and 90-99 DSM. The STM Timing Belt Replacement Kits are conveniently available for your Evo 4/5/6/7 with genuine OEM Mitsubishi parts or choose the purple HKS belts. 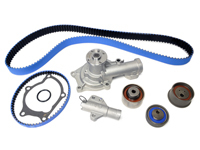 Available with or without the water pump and for engines with or without the balance shaft. 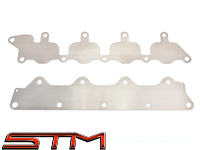 The STM 4G63 Timing Belt / Cam Alignment Tool is unlike any other on the market. When we designed this tool, we did so with the DSM'ers in mind. The STM tool features a wide open center section so you can actually see through to the timing marks on your cam gears making it much easier to use. Works with all 4G63 DSM & Evolution models. 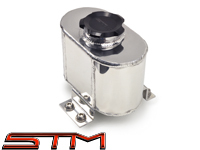 The STM 10% Under-Driven Alternator Pulley with Raised Guides was originally designed to help stop the belt from jumping off at high RPM. With the amount of requests we've had for this product from the racing community, we are very pleased to announce the release! This new revision makes the pulley 10% under-driven and lighter than stock- lightening the load on your alternator. 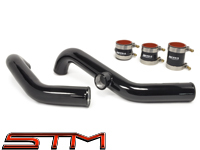 Fits all the Evolution 4/5/6/7/8/9 models and works with OEM and stock replacement belts. 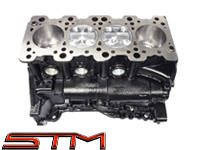 The STM Engine Manifold Block Off Plates are designed to completely seal off your intake or exhaust ports while you have the manifolds off. Whether you're building your motor or swapping out parts, this will keep dust and debris (not to mention creatures) out of the ports, and also makes your fresh build much more photogenic compared to bunched up paper towels. 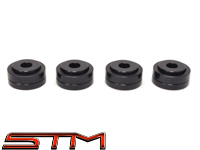 STM Drive Shaft Carrier Bearing Support Bushings are a direct replacement for your worn-out, factory, rubber bushings giving you a more solid feel overall and helping to keep the driveshaft firmly in place for a smooth rotation. 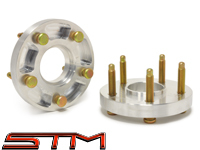 The STM Wheel Spacers & ARP Extended Studs Package includes two 15mm STM Aluminum Wheel Spacers and ten ARP Extended Wheel Studs. Fits 5x114.3 Mitsubishi among many other applications. The STM Wheel Spacers & ARP Extended Studs Package includes two 20mm STM Aluminum Wheel Spacers and ten ARP Extended Wheel Studs. Fits 5x114.3 Mitsubishi among many other applications. 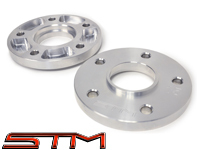 The STM Aluminum Wheel Spacers are machined aluminum and hollowed for an extra lightweight advantage. 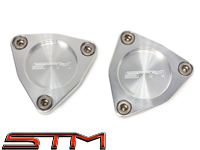 These 15mm spacers weigh only .85 pounds each and feature the STM logo, along with a clearly marked millimeter size. ARP Elongated Wheel Studs are required when running these spacers. 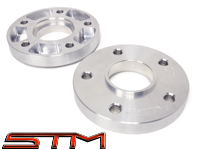 The STM Aluminum Wheel Spacers are machined aluminum and hollowed for an extra lightweight advantage. 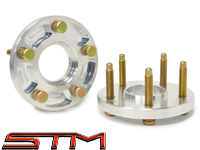 These 20mm spacers weigh only 1.10 pounds each and feature the STM logo, along with a clearly marked millimeter size. ARP Elongated Wheel Studs are required when running these spacers.